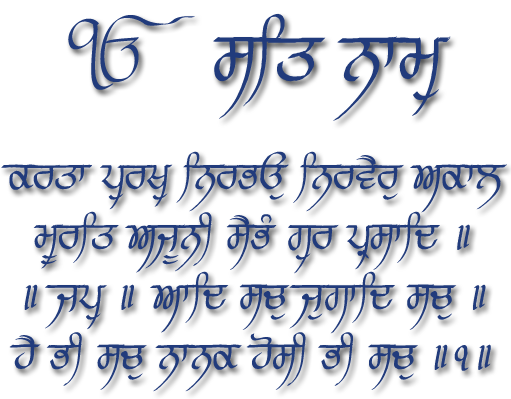 eGurbani is a term to describe the digital version of Gurbani, the word of the Guru, primarily referring to the Sikh Holy Scripture, the Shri Guru Granth Sahib Ji. Some interesting thoughts for you. With the advent of digital mobile devices like the Kindle, the iPhone and the iPad, naturally eGurbani is becoming more accessible and available in a variety of digital formats. Although digital is the future, I think as Sikhs we would agree that nothing can replace the physical presence of the Shri Guru Granth Sahib Ji, the Sikh Holy Scripture, in the form of paper and ink. The physical presence of the Guru on a throne and in an environment which is full of sanctity, reverence, incense and serenity is irreplaceable. However, we do need to make our Guru, our teacher more accessible to the world. The Christians, Muslims, Hindus, Buddhists, Bahais and Jews have very successfully done this with their own scriptures. The Sikhs are lagging way behind and have been very lazy and selfish in this regard, keeping the Guru to ourselves as if we own the Guru. Many proponents of eGurbani think that the distribution of eGurbani should be controlled carefully and kept under close supervision – but this is an old mentality and against the principles of Sikhism, the modern era of openness and of the modern technological trend of Open Source community development. It is time for us to evolve as a community and realise that the word and teachings of the Guru are for the good of all, a concept known in Sikhism as “Sarbat Da Bhallah“. The Sikh Holy Scripture contains within it many gems, rubies and diamonds that the world is crying out for. It contains the medicine that medicine cannot cure. It contains the love that is today is our greatest recession. It contains the peace that has eluded humanity for millennia. But most of all, it contains the secrets to the deepest parts of our psyche which can help to cure the deep depression that flows through society. It can help to temper the inner temper of the modern man and woman. It has a grace. It has an essence. It has a value beyond value itself. In order to create a revolution we must learn to think in a revolutionary way, to exceed and rise above all trends, to create our own trend. In order for us to survive as a human species we must evolve our hearts and minds and access the depths of our soul, our being, our way of seeing. It is only then we can survive the times. In this life there is nothing more revolutionary I have come across than the teachings of the Shri Guru Granth Sahib, which is a form of music, poetry and art that enters into the heart and transforms it completely whether a person understands the ancient sounds or not. The Guru transcends understanding of the mind to bring about understanding of the realm of heart. Only a true Guru can do this, only a Sat Guru, and which more eternal Guru exists than the Word of all word, the Shri Guru Granth Sahib. Sat Naam – Truth Is Your Identity. It’s been a long time since I posted any news – so I am going to make this a regular update from now on. Today I had a really interesting discussion with a university professor in charge of translation studies and it gave me an interesting vision about what the future of the Sikher project might look like, which I’d just like to share with you. Much of the major faiths, especially Christianity and Islam, have always been extremely organised and put a lot of funding towards their translation activities so that their scriptures are available in many different languages. They have organised teams of natives across the world that have scriptural knowledge and created custom software to allow a translator to see all previous translations of a given line of scripture. This approach ensures a translation can be understood by natives speaking a particular language, and also ensures the translation is consistent with previous ones. Another fascinating idea was about cultural context and interpretation of scripture. Some cultures who do not have such a developed language, for example Eskimos, may not have ever seen a sheep, therefore in order to translate a line of scripture containing the word ‘sheep’ into that native language, the word sheep must be turned into the word ‘seal’. Only now could an Eskimo native be able to relate to the line and understand it. Of course for scriptural translation this may seem a little blasphemous, especially if looking at it from a Sikh perspective of respecting the original word of the Guru, however if all translations are just a means to understand and relate to the original scripture, then it makes sense to do this for less developed languages because the message of the scripture can then be understood by the native speaker and can travel further than it would have otherwise. The use of the words ‘planets’, ‘solar systems’ and ‘galaxies’ are only understood in a modern cultural context with our current scientific understanding of the universe, therefore the original words ‘khandd’, ‘manddal’ and ‘varabhanddaa’ could never have exactly meant ‘planets’, ‘solar systems’ and ‘galaxies’ – however today in modern English this is how we can appreciate the original words in Gurmukhi. A translation can never be perfect, and I am not here to say any translation is wrong, my point is simply to show the power and importance of cultural context in translations. In my personal opinion, if a translation can give a person even a glimpse about the meaning of the original line then it is a successful translation and will inspire the reader to search for the deeper meanings behind the scripture. So what does all this mean for the Sikher project? Well, firstly I hope to learn more about the intricacies of translations and as a result I’m getting involved with some translation communities and projects. Secondly, I have deep desire in my heart to create a worldwide translation project which is well organised and funded, I think it would be fantastic to have a translation of Shri Guru Granth Sahib Ji in all the major languages of the world, the most influential languages today being English, Spanish, Russian, French and German – as was the original promise of the Sikher 1.0 software. Thirdly, I’m already working on a few open source software projects that will help speed this vision along and which I shall announce when the time is right. My basic motivation is this: if the Sikh scriptures, the Shri Guru Granth Sahib Ji, has so many gems, jewels and rubies within it which could enrich the lives of thousands with happiness, health and prosperity, then how best to deliver that message to the world? As always, I welcome everyones’ thoughts. Sat Nam. It’s been about two years of no development, due to other life commitments, but now we are back in action and committed to releasing Sikher 1.0 by 31st January 2009. However, we’re going to need your help, so please come forward and volunteer for one of the roles on the contribute page. Then simply send us an email telling us your name, location, skills and which role you would like to volunteer for. It’s really that simple! Coming back into the flow of the project I’m fascinated as to how much was achieved in such a short period of time, and the sheer number of developments that Sikher brought to the world of Gurbani digitisation. We shall be carrying on this crucial work to standardise the storage format of various Sikh scriptures with the XMLGurbani format, as well as collating a number of translations of Shri Guru Granth Sahib Ji in various languages including Spanish, Russian, French and German. Also, there are a number of English translations to Sikh scriptures which exist that have not yet been digitised, and we hope to incorporate these into future releases of Sikher. The other development which Sikher shall bring to the world will be transliterations of Sikh scriptures in every language script of the world, including Arabic, Armenian, Bengali, Cyrillic, Devanagari, Greek, Gujarati, Hebrew and Thai, to name a few. This will enable people all around the world to recite the Word of the Guru in their own language. The implications of this are incomprehensible. Translations may take time to create and perfect in every language, but a transliteration has an immediate impact because it allows a person to recite the unchanging Sound Current of the Guru in their own language and experience the transformation of their own consciousness from individual to universal consciousness. This project is not an individual one, for a single person to undertake, and nor is it a project which is just for Sikhs. It is a project which all communities of all religions should get involved in, because the Sikh way of life is meant for all of humanity as a tool to develop the consciousness and attain a state of self peace. The teachings within the Sikh scripture, the Shri Guru Granth Sahib Ji, gives any human being an access to address their own negative tendencies, insecurities and limitations, and at the same time, allows a person to explore their own perfection, beauty and infinity. It is through this experience of expanded consciousness that people shall begin to understand reality intuitively, and not intellectually. It is through this experience of self peace that world peace shall become a possibility. The boundaries, divisions and limitations, which we ourselves created, shall fall away, and human beings shall then realise their inter-connectedness to each other and to the universe. So it’s safe to say that the work of digitising Gurbani, the Word of the Guru, is of paramount importance for the progression of humanity to the next level of consciousness. It is this vision that moved me to create Sikher two years ago, and it is this vision which continues to drive me to release Sikher 1.0. I pray that by the grace of God and Guru, that we can continue this crucial work and that may more people from all over the world get involved to help progress the project.